As we conclude our week with Red Heart’s super summer yarn, Creme de la Creme, I give you the link to two patterns I mentioned in yesterday’s post, the Bamboo Stitch Wristers and Cowl. It’s completely up to you if you knit one or both, but I’m going to focus on the wristers because I can really see how amazing they’d be if you’re always cold and work in an air conditioned office. I’ve been in several offices and one thing that’s very common is the ‘temperature wars’. One person is too hot, another person is too cold. How do you decide who to please? Now, you’ll be able to keep your hands a bit warmer while sitting under that air conditioning vent. You can definitely make the matching cowl if the fan is blowing down the back of your neck as well. Really, the only time you’re going to have a chance to wear these cool and knitted accessories in the summertime! Indoors, isn’t that backwards! The photo for the Bamboo Stitch Cowl. The original yarn for this pattern is discontinued now, but I think it looks great in Creme de la Creme. It really shows off the Bamboo Stitch. The bamboo stitch itself isn’t difficult, its basic maneuver consists of *yo, k2, pass yo over* and repeat. You get the pattern by staggering the placement of the basic maneuver. 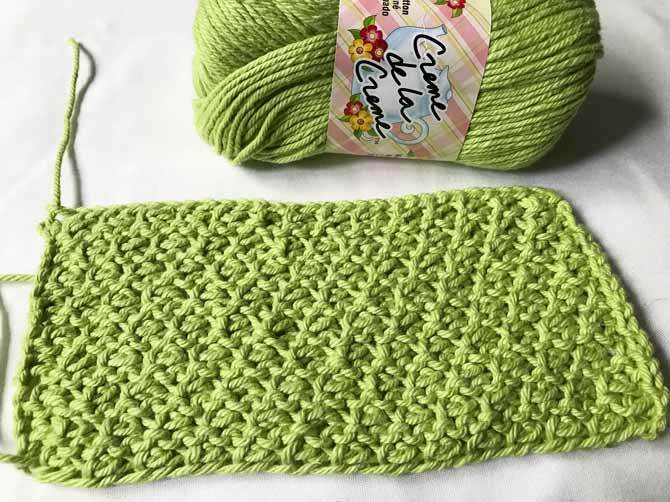 Since the stitch pattern has a texture, the wrister (and cowl) pattern are very plain. The wristers are knit flat and sewn up when they reach 8” [20cm]. The cowl is the same, but you knit it to 12” [30cm] then seam up the edges. They don’t need to be elaborate to look great. The wristers are designed to keep your fingers free to do any typing while keeping your wrists warm and covered. Perfect. Since I posted the photo of the Bamboo stitch in Creme de la Creme yesterday, I thought I would post what the wrong side of the stitch looks like. I even love the wrong side! I’m slightly biased because I have a passion for fingerless mittens. This is definitely a pattern I’ll be adding to my library. I find fingerless mittens or wristers are the perfect gift for anyone. You can always have a few knit up and ready for any occasion. Revive your knitting with marled gradient yarns!